Compare how fast ice cubes melt when exposed to the air or insulated in cloth. Each student group is given their ice cubes, each placed on the lids/trays (to reduce mess). Students immediately wrap one ice cube in the cloth. If they are given foil, they also immediately wrap another ice cube in foil. The last ice cube they leave alone - this is the control, the standard to compare to. The activity is left to run until at least half of the control ice cube has melted, probably between 15 and 30 minutes, depending on the temperature of the classroom. During the wait, do another activity e.g. heat conduction in a metal rod. After the wait period, students open up the ice cube packages, compare the wrapped ice cube to the control (no wrapping), and record the relative sizes of the remaining ice cubes on their worksheet. Students report to the class which of their ice cubes had melted more, and which less. The results are recorded on the board as they are reported. It is expected that in most cases the cloth-wrapped ice has melted less than the control (and that the foil-wrapped ice will be melted more). If individual groups of students get different results, they are still real results, and should also be recorded. This is real science, and heat is complex so often does not give clean results. With multiples of each experimental condition, the class can find out what happens most of the time. The classroom air is warm and is made up of rapidly moving gas molecules. (If the convection activity has been done during the wait, refer to this to explain how the heat moves through the air in the classroom: groups of faster moving molecules move heat energy from one place to another in the classroom.) When these fast moving air molecules bump into the solid ice molecules, they pass their energy to the ice molecules, by conduction (heat transfer by contact). The air molecules transfer enough heat energy to the ice molecules to turn them from a solid into a liquid: the ice melts. 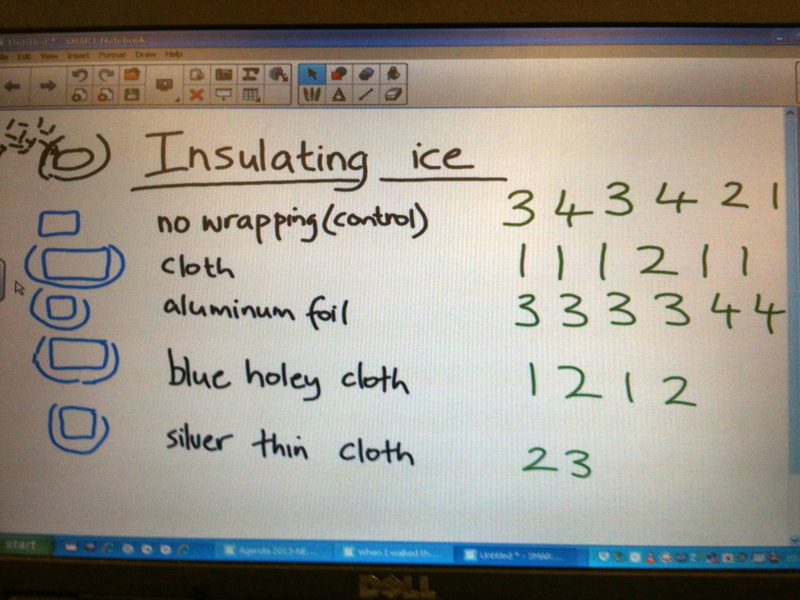 If the ice is wrapped in cloth, the heat of the classroom is not able to transfer to the ice as it is blocked by the cloth. 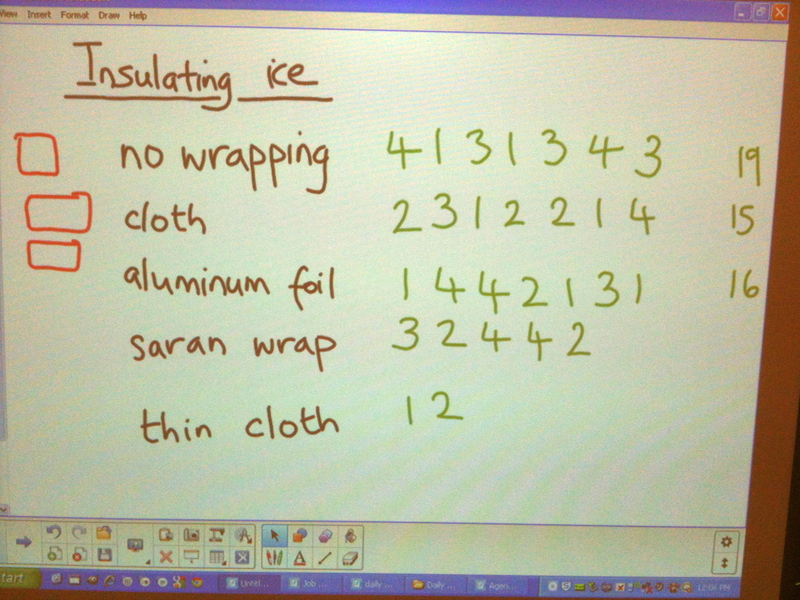 The cloth molecules do not transfer heat well, so “insulate” the ice from the classroom heat. If the ice is wrapped in foil, something different should happen: the foil metal transfers heat very well (it is a good "conductor") so the molecules of the foil readily pass the heat energy in the air of the classroom to the ice, so melting the ice faster than the cloth (and maybe faster even than the ice exposed to the air). For data that did not fit the common trend, students can brainstorm reasons why these experiments were different (e.g. a warm spot in the classroom, the experiment was not as well wrapped). Need to rework so results are cleaner. Try doing the experiment on a paper towel and measuring the size of the wet patch. Note that this activity has a lot of variables, and will depend a lot on the temperature(s) in the classroom, how quickly and securely the students wrap the ice cubes, how much the experiment is handled, and other factors. Run the activity once in the classroom before students try it, to see if it is feasible for your classroom. We got very variable results with grades 2/3, and we added too many different wrappings (see photos of results - they are not very clean results). With younger students simplify to two wrappings. Add just one more (foil) for older students, before trying more wrappings.